Packing is inherently optimistic: there will be occasion for these dress pants, I will trim my beard each morning with these scissors, I will write in this notebook, I will read all these books. When I was accepted into a summer arts program as a high school sophomore, my dear, sweet parents packed the truck with everything I insisted I would need for five weeks at a far off campus. After much unpacking, I was the only kid with a record player, with a dressing gown and a robe, with a library. My first college roommate moved in with two green garbage bags and a baseball mitt. I'd already decorated my side of our room with silhouettes I'd made weeks before of Balinese dancers. I brought (and wore) wooden clogs. I brought two lamps. I've gotten better. Yes, I still check a bag and pay the new surcharge, but it is not so big a bag, and I need the carry-on for magazines, earplugs, mints, a neck-pillow. I am not a good traveler. Even on a short trip home, I need books. My hometown, whatever its quaint charms, doesn't boast a real bookstore. Traveling nowadays usually means, and in fact meant, hours in strange airports with access only to bestsellers and the like. I packed accordingly. My last working day before leaving on vacation, I bought a number of paperbacks. I only buy paperbacks for trips. I only pack books I am prepared to leave behind. I bought a mix of used books and remainders, and spent all of twenty four dollars. It was great fun, shopping. I bought a book I own in a nice edition that I have never read, A Laodicean: A Story of Today, by Thomas Hardy. My new copy was a used Everyman Paperback, from 1997, edited -- though not abridged -- and annotated by one J. H. Stape, whose introduction I read when I got the book home. It was enough. I did not pack the book. Nothing wrong with Hardy, you understand, but I should never have read the damned introduction. I know better. I did read it though, just to get some sense of the thing, to make up my mind about taking the book with me, and the professor wasn't uninteresting. By the end, I simply knew too much; of the novel's plot, of Hardy's life when he wrote it, of the book's place in in the author's oeuvre, etc. So Stape's Hardy stayed behind. I wanted something straightforwardly escapist, something contemporary and a little trashy, something the only purpose of which would be to spin out a plot, but not so obviously as to be boring. A thriller recommended by a coworker, Child 44, by Tom Rob Smith, from just last year, published by Hachette, seemed just the thing. I started it on the first of our two plane rides going, having finished and discarded my magazines. I must confess, the book will make a very good movie. I understand it started out to be just that. It rather reads, as so many contemporary thrillers do, like a well researched screenplay. So when I left it on that first airplane, in the seat-pocket, unfinished, it wasn't because I thought it a bad book. It simply didn't seem like I'd read a novel at all. When I'd read two hundred pages into it, I switched to another book, and then forgot Tom Rob Smith. I will have to wait for the movie, and the sequels I can already imagine, even without reading to the end of the first. The nice thing about forgetting the book is that I'd already forgotten it. I put that thriller down to pick up Hawthorne's The House of Seven Gables, in a little Signet Classic, used, from 1990. I'd read this before, but not for many, many years, and having recently read the first half of Hawthorne's Marble Faun for the first time, and not finding a paperback of that on the shelves at the bookstore, I determined to bring another Hawthorne, and a familiar one, just to read something of his. It was surprisingly familiar, to begin with, and I admit I dozed somewhere around the time old Hepzibah closed her shop up for the day. It is a short novel though, and a wonderful one. I did finish it, later, sitting up in bed in my parents' house, listening to a wonderful summer thunderstorm. Another familiar friend I brought along, an Oxford World's Classics of Great Expectations, from the Bargain Books table, I confess, I opened in our motel room just long enough to read the first three chapters one night before bed. Those three chapters were well worth the five dollars I'd paid for the book. I left it for some lucky housekeeper. I was pretty sure I'd never read Roughing It, by Mark Twain. I hadn't. I didn't. I was assured by my work husband, J., that I "would not like" my last selection, a mass market paperback reprinted by Sphere Books Limited of England, in 1976, but originally published in 1933, The Curse of the Wise Woman, by "Lord Dunsany," aka Edward John Moreton Drax Plunkett, 18th Baron of Dunsany (24 July, 1878 – 25 October, 1957.) I'm afraid I've so convinced my coworker of my stubborn prejudice against the supernatural, that he can not now imagine me reading even so much as ghost story without a disapproving sniff. He was wrong, just this once. Despite a great deal of hunting snipe and the like, I rather enjoyed the witch's revenge and the general atmosphere of Anglo-Irish mythologizing of weird Gaelic hoodoo. With the equally brief Hawthorne, this turned out to be the only book I brought that I did finish. I even brought it home with me -- along with the half dozen books I bought in a not very nice used bookstore I found just down the road from our motel in Monroeville, Pennsylvania. But more of those another night. "Only the wealthy or the very poor can live in the past; only the former do so by choice." When I was a child, home was an irreducible fact. Its size and measure, its proportions, occupancy and even its location were mutable, but home it always was. I might imagine myself elsewhere, what child does not? I might even come to live elsewhere and quickly did, it seems to me now, but to it I might securely return forever. I was lucky in that. That was as it should be. Now I'm grown, home is divisible. Going home means one thing going, and quite another coming back. I'm grateful for the chance of both. Home for me now is where I am, where I've made my life. My parents, briefly, had some small experience of life away from where they were born; my father had an adventure to California with a friend before they both were sent to war in Korea, my parents lived for awhile in Cleveland, but did not take to it. They came back and stayed. They raised me in the house my father was raised in, in the house, at least in part, his father raised, the house in which my brother now lives, our parents just across the yard in a house they bought and built before I was twelve. That is the place I knew as home and to which I just returned and from which just yesterday I came home. Our patrimony, those three and a half acres, those houses, buildings and sheds, that ground, date back in our family almost further than our admittedly careless memories can recall. Repairing the kitchen ceiling once in the elder house, my father found a carving on a beam dated 1857, but did not know whose hand made the mark. My parents had the advantage of being sure at least of the place they occupy. I was not made so, did not stay, couldn't have and still become who I am. I had to make my home in a place other than home, and with a man, a circumstance my parents could not have anticipated and may never fully understand, though they've come to love us both and respect the choices I've made and the man I made them with. Home for me now is where he is, as much or more than where they still are, and for longer now than I lived at home. My parents are growing old, far away from me, still in the place where they grew up, where they met, fell in love, married, worked, raised their children. With each visit home, I wonder now how long they will still be as they are, as I have known them all my life. I can think of them nowhere else but where they are, where and as they have always been for me. Again, I count myself lucky. Like most people who earned their living with their backs and their hands, standing, bending, working, they are now older than their years. My father can not trust his legs to go hunting anymore. My mother doesn't make candy at Christmas, or get to every cobweb, or drive much, though she could if she wanted to. The depredations of illness and loss tell on them both, evident even to each other, though neither seems to see anything in the other but what has always been there, been counted on, known and trusted. They worry each other, and about each other, as much or more than they worry their children. When I'm not home, I hear all this on the telephone. When I am home with them, I see it, though not when they laugh, at each other, with me, at the weather, chance, memory, time, even death. That last, I think, may be the peasant in us, making rude gestures and jokes more easily certainly than any of us might pray, trusting more to luck and love than to any God or Fate. 54 years ago, today, my parents married. They stayed -- to raise their children, care for their parents, for strangers and the children of strangers, passing the seasons and the years together, inseparable. To imagine either without the other, my sister, who like me made a home from scratch, elsewhere, in her case in far away Texas, is unimaginable, unspeakable, dead wrong. She will not hear any talk of wills or death or the passing away of her other home or of the people in it. I understand her refusal. Our parents can not quite afford such anymore. I'm sure they find her devotion as touching as I do, but neither imagines the other indestructible -- the evidence, as my Dad might say, is all against them. Every day for them now, together, they would joke, is a jape at mortality, as it ought to be for us all, but, I think, also an affirmation of the rightness of their lives, though they'd never assume anything so important to themselves. I love them and may say such things. If I do not live nearer them, it is no fault of theirs, let me be clear about that, but neither was it a choice I had. And if I've made a home and a family of my friends in a way and a place away from them, they made a home to which I still gratefully return, and now at last with the man in whom I found my other home. If I have made a home, it is only because they taught me how. I wish them sincere felicitations on this day. I send them our love. I miss them more than I thought possible. I miss home already. I'm glad to be home again. "Small towns are hard places to be different. Those yellow jackets are vigilant, and they can sting." And yet, he is here by right. He is neither so warm nor so dear as Dickens. Much of his smaller work is too much of it's time, reflecting a kind of fun which isn't what it was. But he is masterful, I insist; at his best, even at something other, when just, as here, working just as Punch, he is nimble, bright and smart. Why William Makepeace Thackeray? Because you do not know him as you should, and I can still find unexpected delight by just opening almost any book of his I own. I dare say the reader has remarked that the upright and independent vowel, which stands in the vowel-list between E and O, has formed the subject of the main part of these essays. How does that vowel feel this morning?—fresh, good-humored, and lively? The Roundabout lines, which fall from this pen, are correspondingly brisk and cheerful. Has anything, on the contrary, disagreed with the vowel? Has its rest been disturbed, or was yesterday's dinner too good, or yesterday's wine not good enough? Under such circumstances, a darkling, misanthropic tinge, no doubt, is cast upon the paper. The jokes, if attempted, are elaborate and dreary. The bitter temper breaks out. That sneering manner is adopted, which you know, and which exhibits itself so especially when the writer is speaking about women. A moody carelessness comes over him. He sees no good in anybody or thing: and treats gentlemen, ladies, history, and things in general, with a like gloomy flippancy. Agreed. When the vowel in question is in that mood, if you like airy gayety and tender gushing benevolence—if you want to be satisfied with yourself and the rest of your fellow-beings; I recommend you, my dear creature, to go to some other shop in Cornhill, or turn to some other article. There are moods in the mind of the vowel of which we are speaking, when it is ill-conditioned and captious. Who always keeps good health, and good humor? Do not philosophers grumble? Are not sages sometimes out of temper? and do not angel-women go off in tantrums? To-day my mood is dark. I scowl as I dip my pen in the inkstand. Here is the day come round—for everything here is done with the utmost regularity:—intellectual labor, sixteen hours; meals, thirty-two minutes; exercise, a hundred and forty-eight minutes; conversation with the family, chiefly literary, and about the housekeeping, one hour and four minutes; sleep, three hours and fifteen minutes (at the end of the month, when the Magazine is complete, I own I take eight minutes more); and the rest for the toilette and the world. Well, I say, the Roundabout Paper Day being come, and the subject long since settled in my mind, an excellent subject—a most telling, lively, and popular subject—I go to breakfast determined to finish that meal in 9 3/4 minutes, as usual, and then retire to my desk and work, when—oh, provoking!—here in the paper is the very subject treated, on which I was going to write! Yesterday another paper which I saw treated it—and of course, as I need not tell you, spoiled it. Last Saturday, another paper had an article on the subject; perhaps you may guess what it was—but I won't tell you. Only this is true, my favorite subject, which was about to make the best paper we have had for a long time: my bird, my game that I was going to shoot and serve up with such a delicate sauce, has been found by other sportsmen; and pop, pop, pop, a half-dozen of guns have banged at it, mangled it, and brought it down. "And can't you take some other text?" say you. All this is mighty well. But if you have set your heart on a certain dish for dinner, be it cold boiled veal, or what you will, and they bring you turtle and venison, don't you feel disappointed? During your walk you have been making up your mind that that cold meat, with moderation and a pickle, will be a very sufficient dinner: you have accustomed your thoughts to it; and here, in place of it, is a turkey, surrounded by coarse sausages, or a reeking pigeon-pie or a fulsome roast-pig. I have known many a good and kind man made furiously angry by such a contretemps. I have known him lose his temper, call his wife and servants names, and a whole household made miserable. If, then, as is notoriously the case, it is too dangerous to balk a man about his dinner, how much more about his article? I came to my meal with an ogre-like appetite and gusto. Fee, faw, fum! Wife, where is that tender little Princekin? Have you trussed him, and did you stuff him nicely, and have you taken care to baste him and do him, not too brown, as I told you? Quick! I am hungry! I begin to whet my knife, to roll my eyes about, and roar and clap my huge chest like a gorilla; and then my poor Ogrina has to tell me that the little princes have all run away, whilst she was in the kitchen, making the paste to bake them in! I pause in the description. I won't condescend to report the bad language, which you know must ensue, when an ogre, whose mind is ill regulated, and whose habits of self-indulgence are notorious, finds himself disappointed of his greedy hopes. What treatment of his wife, what abuse and brutal behavior to his children, who, though ogrillons, are children! My dears, you may fancy, and need not ask my delicate pen to describe, the language and behavior of a vulgar, coarse, greedy, large man with an immense mouth and teeth, which are too frequently employed in the gobbling and crunching of raw man's meat. And in this circuitous way you see I have reached my present subject, which is, Ogres. You fancy they are dead or only fictitious characters—mythical representatives of strength, cruelty, stupidity, and lust for blood? Though they had seven-leagued boots, you remember all sorts of little whipping-snapping Tom Thumbs used to elude and outrun them. They were so stupid that they gave into the most shallow ambuscades and artifices: witness that well-known ogre, who, because Jack cut open the hasty-pudding, instantly ripped open his own stupid waistcoat and interior. They were cruel, brutal, disgusting, with their sharpened teeth, immense knives, and roaring voices! but they always ended by being overcome by little Tom Thumbkins, or some other smart little champion. Came riding through the forest." And down, after a combat, would go the brutal persecutor, with a lance through his midriff. Yes, I say, this is very true and well. But you remember that round the ogre's cave the ground was covered, for hundreds and hundreds of yards, WITH THE BONES OF THE VICTIMS whom he had lured into the castle. Many knights and maids came to him and perished under his knife and teeth. Were dragons the same as ogres? monsters dwelling in caverns, whence they rushed, attired in plate armor, wielding pikes and torches, and destroying stray passengers who passed by their lair? Monsters, brutes, rapacious tyrants, ruffians, as they were, doubtless they ended by being overcome. But, before they were destroyed, they did a deal of mischief. The bones round their caves were countless. They had sent many brave souls to Hades, before their own fled, howling out of their rascal carcasses, to the same place of gloom. There is no greater mistake than to suppose that fairies, champions, distressed damsels, and by consequence ogres, have ceased to exist. It may not be OGREABLE to them (pardon the horrible pleasantry, but as I am writing in the solitude of my chamber, I am grinding my teeth—yelling, roaring, and cursing—brandishing my scissors and paper-cutter, and as it were, have become an ogre). I say there is no greater mistake than to suppose that ogres have ceased to exist. We all KNOW ogres. Their caverns are round us, and about us. There are the castles of several ogres within a mile of the spot where I write. I think some of them suspect I am an ogre myself. I am not: but I know they are. I visit them. I don't mean to say that they take a cold roast prince out of the cupboard, and have a cannibal feast before ME. But I see the bones lying about the roads to their houses, and in the areas and gardens. Politeness, of course, prevents me from making any remarks; but I know them well enough. One of the ways to know 'em is to watch the scared looks of the ogres' wives and children. They lead an awful life. They are present at dreadful cruelties. In their excesses those ogres will stab about, and kill not only strangers who happen to call in and ask a night's lodging, but they will outrage, murder, and chop up their own kin. We all know ogres, I say, and have been in their dens often. It is not necessary that ogres who ask you to dine should offer their guests the PECULIAR DISH which they like. They cannot always get a Tom Thumb family. They eat mutton and beef too; and I dare say even go out to tea, and invite you to drink it. But I tell you there are numbers of them going about in the world. And now you have my word for it, and this little hint, it is quite curious what an interest society may be made to have for you, by your determining to find out the ogres you meet there. What does the man mean? says Mrs. Downright, to whom a joke is a very grave thing. I mean, madam, that in the company assembled in your genteel drawing-room, who bow here and there and smirk in white neck-cloths, you receive men who elbow through life successfully enough, but who are ogres in private: men wicked, false, rapacious, flattering; cruel hectors at home, smiling courtiers abroad; causing wives, children, servants, parents, to tremble before them, and smiling and bowing as they bid strangers welcome into their castles. I say, there are men who have crunched the bones of victim after victim; in whose closets lie skeletons picked frightfully clean. When these ogres come out into the world, you don't suppose they show their knives, and their great teeth? A neat simple white neck-cloth, a merry rather obsequious manner, a cadaverous look, perhaps, now and again, and a rather dreadful grin; but I know ogres very considerably respected: and when you hint to such and such a man, "My dear sir, Mr. Sharpus, whom you appear to like, is, I assure you, a most dreadful cannibal;" the gentleman cries, "Oh, psha, nonsense! Dare say not so black as he is painted. Dare say not worse than his neighbors." We condone everything in this country—private treason, falsehood, flattery, cruelty at home, roguery, and double dealing. What! Do you mean to say in your acquaintance you don't know ogres guilty of countless crimes of fraud and force, and that knowing them you don't shake hands with them; dine with them at your table; and meet them at their own? Depend upon it, in the time when there were real live ogres in real caverns or castles, gobbling up real knights and virgins, when they went into the world—the neighboring market-town, let us say, or earl's castle—though their nature and reputation were pretty well known, their notorious foibles were never alluded to. You would say, "What, Blunderbore, my boy! How do you do? How well and fresh you look! What's the receipt you have for keeping so young and rosy?" And your wife would softly ask after Mrs. Blunderbore and the dear children. Or it would be, "My dear Humguffin! try that pork. It is home-bred, homefed, and, I promise you, tender. Tell me if you think it is as good as yours? John, a glass of Burgundy to Colonel Humguffin!" You don't suppose there would be any unpleasant allusions to disagreeable home-reports regarding Humguffin's manner of furnishing his larder? I say we all of us know ogres. We shake hands and dine with ogres. And if inconvenient moralists tell us we are cowards for our pains, we turn round with a tu quoque, or say that we don't meddle with other folk's affairs; that people are much less black than they are painted, and so on. What! Won't half the county go to Ogreham Castle? Won't some of the clergy say grace at dinner? Won't the mothers bring their daughters to dance with the young Rawheads? And if Lady Ogreham happens to die—I won't say to go the way of all flesh, that is too revolting—I say if Ogreham is a widower, do you aver, on your conscience and honor, that mothers will not be found to offer their young girls to supply the lamented lady's place? How stale this misanthropy is! Something must have disagreed with this cynic. Yes, my good woman. I dare say you would like to call another subject. Yes, my fine fellow; ogre at home, supple as a dancing-master abroad, and shaking in thy pumps, and wearing a horrible grin of sham gayety to conceal thy terror, lest I should point thee out:—thou art prosperous and honored, art thou? I say thou hast been a tyrant and a robber. Thou hast plundered the poor. Thou hast bullied the weak. Thou hast laid violent hands on the goods of the innocent and confiding. Thou hast made a prey of the meek and gentle who asked for thy protection. Thou hast been hard to thy kinsfolk, and cruel to thy family. Go, monster! Ah, when shall little Jack come and drill daylight through thy wicked cannibal carcass? I see the ogre pass on, bowing right and left to the company; and he gives a dreadful sidelong glance of suspicion as he is talking to my lord bishop in the corner there. Ogres in our days need not be giants at all. In former times, and in children's books, where it is necessary to paint your moral in such large letters that there can be no mistake about it, ogres are made with that enormous mouth and ratelier which you know of, and with which they can swallow down a baby, almost without using that great knife which they always carry. They are too cunning now-a-days. They go about in society, slim, small, quietly dressed, and showing no especially great appetite. In my own young days there used to be play ogres—men who would devour a young fellow in one sitting, and leave him without a bit of flesh on his bones. They were quiet gentlemanlike-looking people. They got the young fellow into their cave. Champagne, pate-de-foie-gras, and numberless good things, were handed about; and then, having eaten, the young man was devoured in his turn. I believe these card and dice ogres have died away almost as entirely as the hasty-pudding giants whom Tom Thumb overcame. Now, there are ogres in City courts who lure you into their dens. About our Cornish mines I am told there are many most plausible ogres, who tempt you into their caverns and pick your bones there. In a certain newspaper there used to be lately a whole column of advertisements from ogres who would put on the most plausible, nay, piteous appearance, in order to inveigle their victims. You would read, "A tradesman, established for seventy years in the City, and known, and much respected by Messrs. N. M. Rothschild and Baring Brothers, has pressing need for three pounds until next Saturday. He can give security for half a million, and forty thousand pounds will be given for the use of the loan," and so on; or, "An influential body of capitalists are about to establish a company, of which the business will be enormous and the profits proportionately prodigious. They will require A SECRETARY, of good address and appearance, at a salary of two thousand per annum. He need not be able to write, but address and manners are absolutely necessary. As a mark of confidence in the company, he will have to deposit," &c.; or, "A young widow (of pleasing manners and appearance) who has a pressing necessity for four pounds ten for three weeks, offers her Erard's grand piano, valued at three hundred guineas; a diamond cross of eight hundred pounds; and board and lodging in her elegant villa near Banbury Cross, with the best references and society, in return for the loan." I suspect these people are ogres. There are ogres and ogres. Polyphemus was a great, tall, one-eyed, notorious ogre, fetching his victims out of a hole, and gobbling them one after another. There could be no mistake about him. But so were the Sirens ogres—pretty blue-eyed things, peeping at you coaxingly from out of the water, and singing their melodious wheedles. And the bones round their caves were more numerous than the ribs, skulls, and thigh-bones round the cavern of hulking Polypheme. To the castle-gates of some of these monsters up rides the dapper champion of the pen; puffs boldly upon the horn which hangs by the chain; enters the hall resolutely, and challenges the big tyrant sulking within. We defy him to combat, the enormous roaring ruffian! We give him a meeting on the green plain before his castle. Green? No wonder it should be green: it is manured with human bones. After a few graceful wheels and curvets, we take our ground. We stoop over our saddle. 'Tis but to kiss the locket of our lady-love's hair. And now the vizor is up: the lance is in rest (Gillott's iron is the point for me). A touch of the spur in the gallant sides of Pegasus, and we gallop at the great brute. "Cut off his ugly head, Flibbertygibbet, my squire!" And who are these who pour out of the castle? the imprisoned maidens, the maltreated widows, the poor old hoary grandfathers, who have been locked up in the dungeons these scores and scores of years, writhing under the tyranny of that ruffian! Ah ye knights of the pen! May honor be your shield, and truth tip your lances! Be gentle to all gentle people. Be modest to women. Be tender to children. And as for the Ogre Humbug, out sword, and have at him. If Montaigne is the father of the modern form, then Bacon is his English cousin. Bacon is now better remembered for his championing of science, for his vision of the University, as a philosopher and statesman, than as a writer who helped to redefine the way prose might be made art in English. There was a time when Bacon's essays were made a model not so much for his ideas as for their expression. It can be hard now to imagine a schoolboy being made to read the like of this, but it did happen, even in the United States. The benefit of his example can be seen from Jefferson through Emerson and after. I like him as much for the man he was, with all his warty weaknesses, as for what he wrote. I'm convinced, based if on nothing else but his essays, his company must have been a wonderful thing. Why Sir Francis Bacon? He made English the equal of any language before or since, bless 'im. It hath been an opinion, that the French are wiser than they seem, and the Spaniards seem wiser than they are. But howsoever it be between nations, certainly it is so between man and man. For as the Apostle saith of godliness, Having a show of godliness, but denying the power thereof; so certainly there are, in point of wisdom and sufficiently, that do nothing or little very solemnly: magno conatu nugas. It is a ridiculous thing, and fit for a satire to persons of judgment, to see what shifts these formalists have, and what prospectives to make superficies to seem body, that hath depth and bulk. Some are so close and reserved, as they will not show their wares, but by a dark light; and seem always to keep back somewhat; and when they know within themselves, they speak of that they do not well know, would nevertheless seem to others, to know of that which they may not well speak. Some help themselves with countenance and gesture, and are wise by signs; as Cicero saith of Piso, that when he answered him he fetched one of his brows up to his forehead, and bent the other down to his chin; Respondes, altero ad frontem sublato, altero ad mentum depresso supercilio, crudelitatem tibi non placere. Some think to bear it by speaking a great word, and being peremptory; and go on, and take by admittance, that which they cannot make good. Some, whatsoever is beyond their reach, will seem to despise, or make light of it, as impertinent or curious; and so would have their ignorance seem judgment. Some are never without a difference, and commonly by amusing men with a subtilty, blanch the matter; of whom A. Gellius saith, Hominem delirum, qui verborum minutiis rerum frangit pondera. Of which kind also, Plato, in his Protagoras, bringeth in Prodius in scorn, and maketh him make a speech, that consisteth of distinction from the beginning to the end. Generally, such men in all deliberations find ease to be of the negative side, and affect a credit to object and foretell difficulties; for when propositions are denied, there is an end of them; but if they be allowed, it requireth a new work; which false point of wisdom is the bane of business. To conclude, there is no decaying merchant, or inward beggar, hath so many tricks to uphold the credit of their wealth, as these empty persons have, to maintain the credit of their sufficiency. Seeming wise men may make shift to get opinion; but let no man choose them for employment; for certainly you were better take for business, a man somewhat absurd, than over-formal. One can't really have Steele without Addison. If the two names are forever linked, Addison is forever the senior partner. Captain Steele, as a character, appeals more to modern sensibilities, and to me, but Addison, the poet & politician, the moralist and essayist, the colder personality but the better brain, deserves to be included, as he is, not just in any survey of English literature, but in the libraries and experience of any reader of English prose. As pompous as such an introduction sounds, he really does deserve no less. And he rewards reading and rereading as few other writers do; he is amusing, thoughtful, careful and better the better one knows him. There aren't really that many writers who can be begun again as soon as they've been read through once without the reader feeling anything but happy anticipation in the chance to find still more. Why Joseph Addison? Because I wanted to read this essay again. Let brevity despatch the rapid thought. I have somewhere read of an eminent person who used in his private offices of devotion to give thanks to Heaven that he was born a Frenchman: for my own part I look upon it as a peculiar blessing that I was born an Englishman. Among many other reasons, I think myself very happy in my country, as the language of it is wonderfully adapted to a man who is sparing of his words, and an enemy to loquacity. As I have frequently reflected on my good fortune in this particular, I shall communicate to the public my speculations upon the English tongue, not doubting but they will be acceptable to all my curious readers. The English delight in silence more than any other European nation, if the remarks which are made on us by foreigners are true. Our discourse is not kept up in conversation, but falls into more pauses and intervals than in our neighbouring countries; as it is observed that the matter of our writings is thrown much closer together, and lies in a narrower compass, than is usual in the works of foreign authors; for, to favour our natural taciturnity, when we are obliged to utter our thoughts we do it in the shortest way we are able, and give as quick a birth to our conceptions as possible. This humour shows itself in several remarks that we may make upon the English language. As, first of all, by its abounding in monosyllables, which gives us an opportunity of delivering our thoughts in few sounds. This indeed takes off from the elegance of our tongue, but at the same time expresses our ideas in the readiest manner, and consequently answers the first design of speech better than the multitude of syllables which make the words of other languages more tuneable and sonorous. The sounds of our English words are commonly like those of string music, short and transient, which rise and perish upon a single touch; those of other languages are like the notes of wind instruments, sweet and swelling, and lengthened out into variety of modulation. In the next place we may observe that, where the words are not monosyllables, we often make them so, as much as lies in our power, by our rapidity of pronunciation; as it generally happens in most of our long words which are derived from the Latin, where we contract the length of the syllables, that gives them a grave and solemn air in their own language, to make them more proper for despatch, and more conformable to the genius of our tongue. This we may find in a multitude of words, as "liberty," "conspiracy," "theatre," "orator," &c.
The same natural aversion to loquacity has of late years made a very considerable alteration in our language, by closing in one syllable the termination of our preterperfect tense, as in the words "drown`d," "walk`d," "arriv`d," for " drowned," "walked," "arrived," which has very much disfigured the tongue, and turned a tenth part of our smoothest words into so many clusters of consonants. This is the more remarkable because the want of vowels in our language has been the general complaint of our politest authors, who nevertheless are the men that have made these retrenchments, and consequently very much increased our former scarcity. This reflection on the words that end in "ed" I have heard in conversation from one of the greatest geniuses this age has produced. I think we may add to the foregoing observation, the change which has happened in our language by the abbreviation of several words that are terminated in "eth," by substituting an "s" in the room of the last syllable, as in "drowns," "walks," "arrives," and innumerable other words, which in the pronunciation of our forefathers were "drowneth," "walketh," "arriveth." This has wonderfully multiplied a letter which was before too frequent in the English tongue, and added to that hissing in our language which is taken so much notice of by foreigners, but at the same time humours our taciturnity, and eases us of many superfluous syllables. I might here observe that the same single letter on many occasions does the office of a whole word, and represents the "his" and "her" of our forefathers. There is no doubt but the ear of a foreigner, which is the best judge in this case, would very much disapprove of such innovations, which indeed we do ourselves in some measure, by retaining the old termination in writing, and in all the solemn offices of our religion. As, in the instances I have given, we have epitomised many of our particular words to the detriment of our tongue, so on other occasions we have drawn two words into one, which has likewise very much untuned our language, and clogged it with consonants, as "mayn`t," "can`t," "shan`t," "won`t," and the like, for "may not," "can not," "shall not," "will not," &c.
It is perhaps this humour of speaking no more than we needs must which has so miserably curtailed some of our words, that in familiar writings and conversations they often lose all but their first syllables, as in "mob.," "rep.," "pos.," "incog.," and the like; and as all ridiculous words make their first entry into a language by familiar phrases, I dare not answer for these that they will not in time be looked upon as a part of our tongue. We see some of our poets have been so indiscreet as to imitate Hudibras`s doggrel expressions in their serious compositions, by throwing out the signs of our substantives which are essential to the English language. Nay, this humour of shortening our language had once run so far, that some of our celebrated authors, among whom we may reckon Sir Roger L`Estrange in particular, began to prune their words of all superfluous letters, as they termed them, in order to adjust the spelling to the pronunciation; which would have confounded all our etymologies, and have quite destroyed our tongue. We may here likewise observe that our proper names, when familiarised in English, generally dwindle to monosyllables, whereas in other modern languages they receive a softer turn on this occasion, by the addition of a new syllable.--Nick, in Italian, is Nicolini; Jack, in French, Janot; and so of the rest. There is another particular in our language which is a great instance of our frugality in words, and that is the suppressing of several particles which must be produced in other tongues to make a sentence intelligible. This often perplexes the best writers, when they find the relatives "whom," "which," or "they," at their mercy, whether they may have admission or not; and will never be decided till we have something like an academy, that by the best authorities, and rules drawn from the analogy of languages, shall settle all controversies between grammar and idiom. I have only considered our language as it shows the genius and natural temper of the English, which is modest, thoughtful, and sincere, and which, perhaps, may recommend the people, though it has spoiled the tongue. We might, perhaps, carry the same thought into other languages, and deduce a great part of what is peculiar to them from the genius of the people who speak them. It is certain the light talkative humour of the French has not a little infected their tongue, which might be shown by many instances; as the genius of the Italians, which is so much addicted to music and ceremony, has moulded all their words and phrases to those particular uses. The stateliness and gravity of the Spaniards shows itself to perfection in the solemnity of their language; and the blunt, honest humour of the Germans sounds better in the roughness of the High-Dutch than it would in a politer tongue. Might as well ask, "why Shakespeare?" Molli pollici nec rogata, surgit." ["Neither to be excited by soft words or by the thumb." "Fautor utroque tuum laudabit pollice ludum:"
["Thy patron will applaud thy sport with both thumbs"
Literature is crowded with books that stand alone, or perhaps with but one other of the same parentage. The authors of these singularities may be known to us no other way: think of the author, think of the title. Sometimes this is entirely appropriate, as there was no time to do more, or everything else that was done was not worthy of being remembered, or what was once a whole body of work has died off, limb by limb, until just one evergreen remains. Samuel Butler is read, if and when he still is, is this way. He has two books in any good bookstore. One or the other might be read in a classroom, though I can think of no class that might be made to read both. However he is read still, for me, he is an author whose other work has been worth rooting out as nothing I've found and read has been less than a pleasure to read. Wit is always worth reviving. Why Samuel Butler? Because I found this essay and could not be better pleased to offer it here. One can bring no greater reproach against a man than to say that he does not set sufficient value upon pleasure, and there is no greater sign of a fool than the thinking that he can tell at once and easily what it is that pleases him. To know this is not easy, and how to extend our knowledge of it is the highest and the most neglected of all arts and branches of education. Indeed, if we could solve the difficulty of knowing what gives us pleasure, if we could find its springs, its inception and earliest modus operandi, we should have discovered the secret of life and development, for the same difficulty has attended the development of every sense from touch onwards, and no new sense was ever developed without pains. A man had better stick to known and proved pleasures, but, if he will venture in quest of new ones, he should not do so with a light heart. Another reason is that, except in mere matters of eating and drinking, people do not realise the importance of finding out what it is that gives them pleasure if, that is to say, they would make themselves as comfortable here as they reasonably can. Very few, however, seem to care greatly whether they are comfortable or no. There are some men so ignorant and careless of what gives them pleasure that they cannot be said ever to have been really born as living beings at all. They present some of the phenomena of having been born--they reproduce, in fact, so many of the ideas which we associate with having been born that it is hard not to think of them as living beings--but in spite of all appearances the central idea is wanting. At least one half of the misery which meets us daily might be removed or, at any rate, greatly alleviated, if those who suffer by it would think it worth their while to be at any pains to get rid of it. That they do not so think is proof that they neither know, nor care to know, more than in a very languid way, what it is that will relieve them most effectually or, in other words, that the shoe does not really pinch them so hard as we think it does. For when it really pinches, as when a man is being flogged, he will seek relief by any means in his power. So my great namesake said, "Surely the pleasure is as great Of being cheated as to cheat"; and so, again, I remember to have seen a poem many years ago in Punch according to which a certain young lady, being discontented at home, went out into the world in quest to "Some burden make or burden bear. But which she did not greatly care--Oh Miseree!" So long as there was discomfort somewhere it was all right. To those, however, who are desirous of knowing what gives them pleasure but do not quite know how to set about it I have no better advice to give than that they must take the same pains about acquiring this difficult art as about any other, and must acquire it in the same way--that is by attending to one thing at a time and not being in too great a hurry. Proficiency is not to be attained here, any more than elsewhere, by short cuts or by getting other people to do work that no other than oneself can do. Above all things it is necessary here, as in all other branches of study, not to think we know a thing before we do know it--to make sure of our ground and be quite certain that we really do like a thing before we say we do. When you cannot decide whether you like a thing or not, nothing is easier than to say so and to hang it up among the uncertainties. Or when you know you do not know and are in such doubt as to see no chance of deciding, then you may take one side or the other provisionally and throw yourself into it. This will sometimes make you uncomfortable, and you will feel you have taken the wrong side and thus learn that the other was the right one. Sometimes you will feel you have done right. Any way ere long you will know more about it. But there must have been a secret treaty with yourself to the effect that the decision was provisional only. For, after all, the most important first principle in this matter is the not lightly thinking you know what you like till you have made sure of your ground. I was nearly forty before I felt how stupid it was to pretend to know things that I did not know and I still often catch myself doing so. Not one of my school-masters taught me this, but altogether otherwise. I should like to like Schumann's music better than I do; I dare say I could make myself like it better if I tried; but I do not like having to try to make myself like things; I like things that make me like them at once and no trying at all. To know whether you are enjoying a piece of music or not you must see whether you find yourself looking at the advertisements of Pears' soap at the end of the programme. A play still performed, a novel still in print, bought and read, a poem still anthologized and worthy to be read, at length, aloud, a name, in other words, that survives down to this day, and yet my favorite of his many arts, his essays, are unread. Oliver Goldsmith embarrassed himself in conversation. He tried too hard too often, he said too much, or claimed too much, or revealed too much of his faults, and so comes down to us now, via Boswell, as a bit of a fool; an ugly little Mick in a silly wig and worse clothes, boasting, spiteful, wrong. Johnson defends him, of course. Johnson loved the man, and he knew his worth, but if we are to understand why, we've only to open The Citizen of the World, or read an essay from The Bee, and there is the man Johnson could forgive anything, defend even against their friends, and for the sudden death of whom all wept. Why Goldsmith? There's not a man alive who might not envy the company of such a fool as this. In reading the newspapers here, I have reckoned up not less than twenty-five great men, seventeen very great men, and nine very extraordinary men in less than the compass of half a year. These, say the gazettes, are the men posterity are to gaze at with admiration; these the names that fame will be employed in holding up for the astonishment of succeeding ages. Let me see -- forty-six great men in half a year, amounts to just ninety-two in a year. -- I wonder how posterity will be able to remember them all, or whether the people, in future times, will have any other business to mind, but that of getting the catalogue by heart. Does the mayor of a corporation make a speech? he is instantly set down for a great man. Does a pedant digest his common place book into a folio? he quickly becomes great. Does a poet string up trite sentiments in rhyme? he also becomes the great man of the hour. How diminutive soever the object of admiration, each is followed by a crowd of still more diminutive admirers. The shout begins in his train, onward he marches towards immortality, looks back at the pursuing crowd with self satisfaction: catching all the oddities, the whimsies, the absurdities, and the littleness of conscious greatness, by the way. I was yesterday invited by a gentleman to dinner, who promised that our entertainment should consist of a haunch of venison, a turtle, and a great man. I came, according to appointment. The venison was fine, the turtle good, but the great man insupportable. The moment I ventured to speak, I was at once contradicted with a snap. I attempted, by a second and third assault, to retrieve my lost reputation, but was still beat back with confusion. I was resolved to attack him once more from entrenchment, and turned the conversation upon the government of China: but even here he asserted, snapped, and contradicted as before. Heavens, thought I, this man pretends to know China even better than myself! I looked round to see who was on my side, but every eye was fixed in admiration on the great man; I therefore, at last thought proper to sit silent, and act the pretty gentleman during the ensuing conversation. When a man has once secured a circle of admirers, he may be ridiculous here as he thinks proper; and it all passes for elevation of sentiment, or learned absence. If he transgresses the common forms of breeding, mistakes even a teapot for a tobacco-box, it is said, that his thoughts are fixed on more important objects: to speak and act like the rest of mankind is to be no greater than they. There is something of oddity in the very idea of greatness: for we seldom astonished at a thing very much resembling ourselves. When the Tartars make a Lama, their first care is to place him in a dark corner of the temple; here he is to sit half concealed from view, to regulate the motions of his hands, lips, and eyes; but, above all, he is enjoined gravity and silence. This, however, is but the prelude to his apotheosis: a set of emissaries are dispatched among the people to cry up his piety, gravity, and love of raw flesh; the people take them at their word, approach the Lama, now become an idol, with the most humble prostration; he receives their addresses without motion, commences a god, and is ever after fed by his priests with the spoon of immortality. The same receipt in this country serves to make a great man. The idol only keeps close, sends out his little emissaries to be hearty in his praise, and straight, whether statesman or author, he is set down in the list of fame, continuing to be praised while it is fashionable to praise, or while he prudently keeps his minuteness concealed from the public. I have visited many countries, and have been in cities without number, yet never did I enter a town which could not produce ten or twelve of those little great men; all fancying themselves known to the rest of the world, and complimenting each other upon their extensive reputation. It is amusing enough when two of those domestic prodigies mount the stage of ceremony, and give and take praise from each other. I have been present when a German doctor, for having pronounced a panegyric upon a certain monk, was thought the most ingenious man in the world; till the monk soon after divided this reputation by returning the compliment; by which means they both marched off with universal applause. The same degree of undeserved adulation that attends our great man while living, often follows him to the tomb. It frequently happens that one of his little admirers sits down big with the important subject, and is delivered of the history of his life and writings. This may properly be called the revolutions of a life between the fireside and the easy-chair. In this we learn, the year in which he was born, at what an early age he gave symptoms of uncommon genius and application, together with some of his smarter sayings, collected by his aunt and mother, while yet but a boy. The next book introduces him to the University, where we are informed of his amazing progress in learning, his excellent skill in darning stockings, and his new invention for papering books to save the covers. He next makes his appearance in the republic of letters, and publishes his folio. Now the colossus is reared, his works are eagerly bought up by all the purchasers of scarce books. The learned societies invite him to become a member; he disputes against some foreigner with a long Latin name, conquers in the controversy, is complimented by several authors of gravity and importance, is excessively fond of egg-sauce with his pig, becomes president of a literary club, and dies in the meridian of his glory. Happy they, who thus have some little faithful attendant, who never forsakes them, but prepares to wrangle and to praise against every opposer; at once ready to increase their pride while living, and their character when dead. For you and I, my friend, who have no humble admirer thus to attend us, we, who neither are, nor ever will be great men, and who do not much care whether we are great men or no, at least let us strive to be honest men, and to have common sense. No better critic, no better intelligence, no better prose, no better pleasure in English literature is to be had from an essay than that which might be found on almost any page in the essays of William Hazlitt. He's had a better time of it of late than for a very long time, what with two recent biographies and what looks to be a renewed interest in at least his politics and his person. But this has not yet led to a decent and affordable selection of his essays being reissued. He deserves better than he's had. Meanwhile, in reading just this one brief example, imagine how many he wrote with the same graceful style, essay after essay, on subjects across the full range of a wide experience, astonishing scholarship, and profound perception. Why William Hazlitt? Because there is no greater essayist in English. I hate to read new books. There are twenty or thirty volumes that I have read over and over again, and these are the only ones that I have any desire ever to read at all. It was a long time before I could bring myself to sit down to the Tales of My Landlord, but now that author's works have made a considerable addition to my scanty library. I am told that some of Lady Morgan's are good, and have been recommended to look into Anastasius; but I have not yet ventured upon that task. A lady, the other day, could not refrain from expressing her surprise to a friend, who said he had been reading Delphine:2 -- she asked, -- If it had not been published some time back? Women judge of books as they do of fashions or complexions, which are admired only "in their newest gloss." That is not my way. I am not one of those who trouble the circulating libraries much, or pester the booksellers for mail-coach copies of standard periodical publications. I cannot say that I am greatly addicted to black-letter, but I profess myself well versed in the marble bindings of Andrew Millar in the middle of the last century; nor does my taste revolt at Thurlow's State Papers, in russia leather; or an ample impression of Sir William Temple's Essays, with a portrait after Sir Godfrey Kneller in front. I do not think altogether the worse for a book for having survived the author a generation or two. I have more confidence in the dead than the living. Contemporary writers may generally be divided into two classes -- one's friends or one's foes. Of the first we are compelled to think too well, and of the last we are disposed to think to ill, to receive much genuine pleasure from the perusal, or to judge fairly of the merits of either. One candidate for literary fame, who happens to be of our acquaintance, writes finely, and like a man of genius; but unfortunately has a foolish face, which spoils a delicate passage:---another inspires us with the highest respect for his personal talents and character, but does not quite come up to our expectations in print. All these contradictions and petty details interrupt the calm current of our reflections. If you want to know what any of the authors were who lived before our time, and are still objects of anxious inquiry, you have only to look into their works. But the dust and smoke and noise of modern literature have nothing in common with the pure, silent air of immortality. My father Shandy solaced himself with Bruscambille. Give me for this purpose a volume of Peregrine Pickle or Tom Jones. Open either of them anywhere -- at the Memoirs of Lady Vane, or the adventures at the masquerade with Lady Bellaston, or the dispute between Thwackum and Square, or the escape of Molly Seagrim, or the incident of Sophia and her muff, or the edifying prolixity of her aunt's lecture -- and there I find the same delightful, busy, bustling scene as ever, and feel myself the same as when I was first introduced into the midst of it. Nay, sometimes the sight of an odd volume of these good old English authors on a stall, or the name lettered on the back among others in the shelves of a library, answers the purpose, revives the whole train of ideas, and sets "the puppets dallying." Twenty years are stuck off the list, and I am a child again. A sage philosopher, who was not a very wise man, said, the he should like very well to be young again, if he could take his experience along with him. This ingenious person did not seem to be aware, by the gravity of his remark, that the great advantage of being young is to be without this weight of experience, which he would fain place upon the shoulders of youth, and which never comes too late with years. Oh! what a privilege to be able to let his hump, like Christian's burthen, drop from off one's back, and transport oneself, by the help of a little musty duodecimo, to the time when "ignorance was bliss," and when we first got a peep at the raree-show of the world, through the glass of fiction -- gazing at mankind, as we do at wild beasts in a menagerie, through the bars of their cages, -- or at curiosities in a museum, that we must not touch! For myself, not only are the old ideas of the contents of the work brought back to my mind in all their vividness, but the old associations of the faces and persons of those I then knew, as they were in their life-time -- the place where I sat to read the volume, the day when I got it, the feeling of the air, the fields, the sky -- return, and all my early impressions with them. This is better to me -- those places, those times, those persons, and those feelings that come across me as I retrace the story and devour the page, are to me better far then the wet sheets of the last new novels from the Ballentyne press, to say nothing of the Minerva press in Leadenhall Street. It is like visiting the scenes of early youth. I think of the time "when I was in my father's house, and my path ran down with butter and honey," -- when I was a little, thoughtless child, and had no other wish or care but to con my daily task, and be happy! -- Tom Jones, I remember, was the first work that broke the spell. It came down in numbers once a fortnight, in Cooke's pocket-edition, embellished with cuts. I had hitherto read only in school-books and a tiresome ecclesiastical history (with the exception of Mrs Radcliffe's Romance of the Forest): but his had different relish with it, -- "sweet in the mouth," though not "bitter in the belly," It smacked of the world I lived in, and which I was to live -- and showed me groups "gay creatures," not "of the element," but of the earth; not "living in the clouds," but travelling the same road that I did; -- some that had passed on before me, and others that might soon overtake me. My heart had palpitated at the thoughts of a boarding-school ball, or gala-day at Midsummer or Christmas: but the world I had found out in Cooke's edition of the British Novelists was to me a dance through life, a perpetual gala-day. The sixpenny numbers of this work regularly contrived to leave off just in the middle of a sentence, and in the nick of a story, where Tom Jones discovers Square behind the blanket; or where Parson Adams, in the inextricable confusion of events, very undesignedly gets to bed to Mrs Slip-slop. Let me caution the reader against this impression of Joseph Andrews; for there is a picture of Fanny in it which he should not set his heart on, lest he should never meet with anything like it; or if he should, it would, perhaps, be better for him that he had not. It was just like _____ _______! With what eagerness I used to look forward to the next number, and open the prints! Ah! Never again shall I feel the enthusiastic delight with which I gazed at the figures, and anticipated the story and adventures of Major Bath and Commodor Trunnion of Trim and my Uncle Toby, of Don Quixote and Sancho and Dapple, of Gil Blas and Dame Lorenza Sephora, of Laura and the fair Lucretia, whose lips open and shut like buds of roses. To what nameless ideas did they give rise, -- with what airy delights I filled up the outline, as I hung in silence over the page! -- Let met still recall them, that they may breathe fresh life into me, and that I may live that birthday of thought and romantic pleasure over again! Talk of the ideal ! This is the only true ideal -- the heavenly tints of Fancy reflected in the bubbles that float upon the spring-tide of human life. The paradox with which I set out is, I hope, less startling than it was; the reader will, by this time, have been let into my secret. Much about the same time, or I believe rather earlier, I took a particular satisfaction in reading Chubb's Tracts,3 and I often think I will get them again to wade through. There is a high gusto of polemical divinity in them; and you fancy that you hear a club of shoemakers at Salisbury, debating a disputable text from one of St Paul's Epistles in a workmanlike style, with equal shrewdness and pertinacity. I cannot say much for my metaphysical studies, into which I launched shortly after with greater ardour, so as to make a toil of a pleasure. I was presently entangled in the briars and thorns of subtle distinctions, -- of "fate, freewill, foreknowledge absolute," though I cannot add that "in their wandering mazes I found no end; " for I did arrive at some very satisfactory and potent conclusions; nor will I go so far, however ungrateful the subject might seem, as to exclaim with Marlow's Faustus -- "Would I had never seen Wittenberg, never read book" -- that is, never studied such authors as Hartley, Hume, Berkeley, &c. Locke's Essay on the Human Understanding is, however, a work from which I never derived either pleasure or profit; and Hobbes, dry and powerful as he is, I did not read till long afterwards. I read a few poets, which did not much hit my taste, -- for I would have the reader understand, I am deficient in the faculty of imagination; but I fell early upon French romances, and philosophy, and devoured them tooth-and-nail. Many a dainty repast have I made of the New Eloise; -- the description of the kiss; the excursion on the water; the letter of St Preux, recalling the time of their first loves; and the account of Julia's death; these I read over and over again with unspeakable delight and wonder. Some years after, when I met with his [Rousseau's] work again, I found I had lost nearly my whole relish for it (except some few parts),and was, I remember, very much mortified with the change in my taste, which I sought to attribute to the smallness and gilt edges of the edition I had bought, and its being perfumed with rose-leaves. Nothing could exceed the gravity, the solemnity with which I carried home and read the Dedication to the Social Contract, with some other pieces of the same author, which I had picked up at a stall in a coarse leathern cover. Of the Confessions I have spoken elsewhere, and may repeat what I have said -- "Sweet is the dew of their memory, and pleasant the balm of their recollection!" Their beauties are not "scattered like stray-gifts o'er the earth," but sown thick on the page, rich and rare. I wish I had never read the Emilius, or read it with less implicit faith. I had no occasion to pamper my natural aversion to affectation or pretense, by romantic and artificial means. I had better have formed myself on the model of Sir Fopling Flutter. There is a class of person whose virtues and most shining qualities sink in, and are concealed by, an absorbent ground of modesty and reserve; and such a one I do, without vanity profess myself.4 Now these are the very persons who are likely to attach themselves to the character of Emilius, and of whom it is sure to be the bane. This dull, phlegmatic, retiring humour is not in a fair way to be corrected, but confirmed and rendered desperate, by being in that work held up as an object of imitation, as an example of simplicity and magnanimity -- by coming upon us with all the recommendations of novelty, surprise, and superiority to the prejudices of the world -- by being stuck upon a pedestal, made amiable, dazzling, a leurre de dupe! The reliance on solid worth which it inculcates, the preference of sober truth to gaudy tinsel, hangs like a mill-stone round the neck of the imagination -- "a load to sink a navy" -- impedes our progress, and blocks up every prospect in life. A man, to get on, to be successful, conspicuous, applauded, should not retire upon the centre of his conscious resources, but be always at the circumference of appearances. He must envelop himself in a halo of mystery -- he must ride in an equipage of opinion -- he must walk with a train of self-conceit following him -- he must not strip himself to a buff-jerkin, to the doublet and hose of his real merits, but must surround himself with a cortege of prejudices, like the Signs of The Zodiac -- he must seem anything but what he is, and then he may pass for anything he pleases. The world love to be amused by hollow professions, to be deceived by flattering appearances, to live in a state of hallucination; and can forgive everything but the plain, downright, simple, honest truth -- such as we see it chalked out in the character of Emilius. -- To return from this digression, which is a little out of place here. "Marcian Colonna is a dainty book;"
I believe I may date my insight into the mysteries of poetry from the commencement of my acquaintance with the authors6 of the Lyrical Ballads; at least, my discrimination of the higher sorts -- not my predilection of such writers as Goldsmith or Pope: nor do I imagine they will say I got my liking for the Novelists, or the comic writers -- for the characters of Valentine, Tattle or Miss Prue, from them. If so, I must have got from them what they never had themselves. In points where poetic diction and conception are concerned, I may be at a loss, and liable to be imposed upon: but in forming an estimate of passages relating to common life and manners, I cannot think I am a plagiarist from any man. I there "know my cure without a prompter." I may say of such studies, Intus et in cute. I am just able to admire those literal touches of observation and description which persons of loftier pretensions overlook and despise. I think I comprehend something of the characteristic part of Shakespeare; and in him indeed, all is characteristic, even the nonsense and poetry. I believe it was the celebrated Sir Humphrey Davy who used to say, that Shakespeare was rather a metaphysician than a poet. At any rate, it was not ill said. I wish that I had sooner known the dramatic writers contemporary with Shakespeare; for in looking them over about a year ago, I almost revived my old passion for reading, and my old delight in books, though they were very nearly new to me. The periodical Essayists I read long ago. The Spectator I liked extremely: but the Tatler took my fancy most. I read the others soon after, the Rambler, the Adventurer, the World, the Connoisseur: I was not sorry to get to the end of them, and have no desire to go regularly through them again. I consider myself a thorough adept in Richardson. I like the longest of his novels best, and think no part of them tedious; nor should I ask to have anything better to do than to read them from beginning to end, to take them up when I chose, and lay them down when I was tired, in some old family mansion in the country, till every word and syllable relating to the bright Clarissa, the Divine Clementina, the beautiful Pamela, "with every trick and line of their sweet favour," were once more "graven in my heart's table. "7 I have a sneaking kindness for Mackenzie's Julia de Roubigne -- for the deserted mansion, and straggling gilliflowers on the mouldering garden-wall; and still more for his Man of Feeling; not that it is better, nor so good; but at the time I read it, I sometimes thought of the heroine, Miss Walton, and of Miss _______ together, and "that ligament fine as it was, was never broken!" -- One of the poets that I have always read with most pleasure, and can wander about in for ever with a sort of voluptuous indolence, is Spenser, and I like Chaucer even better. The only writer among the Italians I can pretend to any knowledge of, is Boccaccio, and of him I cannot express half my admiration. His story of the Hawk, I could read and think of from day to day, just as I would look at a picture of Titian's! for the theory, which is opposed to them, "falls flat upon the grunsel edge, and shames its worshipers" Let us hear no more, then, of this monkish cant, and bigoted outcry for the restoration of the horns and tail of the devil! -- Again, as to the other work, Burke's Reflections, I took a particular pride and pleasure in it, and read it to myself and others for months afterwards. I had reason for my prejudice in favour of this author. To understand an adversary is some praise: to admire him is more. I thought I did both: I knew I did one. For the first time I ever cast my eyes on anything of Burke's (which was an extract from his Letter to a Noble Lord in a three-times-a-week paper, the St. James's Chronicle, in 1796), I said to myself, "this is true eloquence: this is a man pouring out his mind on paper." All other style seemed to me pedantic and impertinent. Dr Johnson's was walking on stilts; and even Junius's (who was at that time a favourite with me) with all his terseness, shrunk up into little antithetic points and well-trimmed sentences. But Burke's style was forked and playful as the lightening, crested like the serpent. He delivered plain things on plain ground; but when he rose, there was no end of his flights and circumgyrations -- and in this very Letter "he, like an eagle in a dove-cot, fluttered his Volscians" (The Duke of Bedford and the Earl of Lauderdale8) In Corioli." I did not care for his doctrines. I was then and am still, proof against their contagion; but I admired the author, and was considered as not a very staunch partisan of the opposite side, though I thought myself that an abstract proposition was one thing -- a masterly transition, a brilliant metaphor, another. I conceived, too, that he might be wrong in his main argument, and yet deliver fifty truths in arriving at a false conclusion. I remember Coleridge assuring me, as a poetical and political set-off to my sceptical admiration, that Wordsworth had written an Essay on Marriage, which, for manly thought and nervous expression, he deemed incomparably superior. As I had not, at that time seen any specimens of Mr Wordsworth's prose style, I could not express my doubts on the subject. If there are greater prose-writers than Burke, they either lie out of my course of study, or are beyond my sphere of comprehension. I am too old to be a convert to a new mythology of genius. The niches are occupied, the tables are full. If such is still my admiration of this man's misapplied powers, what must it have been at a time when I myself was in vain trying, year after year, to write a single Essay, nay, a single page or sentence; when I regarded the wonders of his pen with the longing eye of one who was dumb and a changeling; and when to be able to convey the slightest conception of my meaning to others in words, was the height of an almost hopeless ambition! But I never measured others' excellences by my own defects; though a sense of my own incapacity, and of the steep, impassable ascent from me to them made me regard them with greater awe and fondness. I have thus run through most of my early studies and favorite authors, some of whom I have since criticized more at large. Whether those observations will survive me, I neither know nor do I much care: But to the works themselves, "worthy of all acceptation," and to the feelings they have always excited in me since I could distinguish a meaning in language, nothing shall ever prevent me from looking back with gratitude and triumph. To have lived in the cultivation of an intimacy with such works, and to have familiarly relished such names, is not to have lived quite in vain. There are other authors whom I have never read, and yet whom I have frequently had a great desire to read, for some circumstances relating to them. Among them is Lord Clarendon's History of the Great Rebellion, after which I have a hankering, for hearing it spoken of by good judges -- from my interest in the events, and the knowledge of the characters from other sources, and from having seen fine portraits of most of them I like to read a well-penned character, and Clarendon is said to have been a master in his way. I should like to read Froissart's Chronicles, Holinshed and Stowe, and Fuller's Worthies. I intend, whenever I can to read Beaumont and Fletcher all through. There are fifty-two of their plays, and I have only read a dozen or fourteen of them. A Wife for Month and Thierry and Theodoret are, I am told delicious, and I can believe it. I should like to read the speeches in Thucydides, and Guicciardini's History of Florence, and Don Quixote in the original. I have often thought of reading the Lives of Persiles and Sigismunda, and the Galatea of the same author. But somehow reserve them like "another Yarrow." I should also like to read the last new novel (if I could be sure it was so) of the Author [Scott] of Waverley: -- no one would be more glad than I to find it the best! Gilbert Keith Chesterton was as big a man as ever cut a caper, danced a jig or jumped. He was fat, you see, and funny, and we forget now, he was not just the apologist memorialized by The Paulist Press, embraced nowadays by Catholics, conservatives, and cranks as the last English saint. He was a great humorist -- a deadly word, I know -- and a genuine wit, whatever his politics or theology, or how he mixed the two. He is delightful, frankly, even when he is wrong, overheated, or too eager to please. I like him best with his beads in his pocket and a beer in his hand, or, as here, with a piece of chalk. He is, at heart, a big fat boy and best when when he is happiest; reading Dickens, drawing pictures, sharing something unexpected, when truant or lost in fantasies. 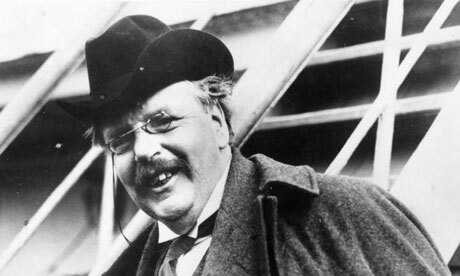 Why G. K. Chesterton? Because he belongs as much or more to English literature, and to me, as he does to the priests, the prigs and the strangely solemn readers of The Man Who Was Thursday. With my stick and my knife, my chalks and my brown paper, I went out on to the great downs. . .